The Veho 360 Stereo Noise Isolating Earphones feature a flex anti tangle cord system to stop your cable from getting tangled up. Compatible with all your mobile devices that use a 3.5mm output jack, the 10mm speaker delivers high quality sound with bass enhancement. 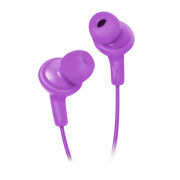 These stylish black earphones feature a white cable and different sizes of earbuds to ensure you get a comfortable fit. - A.D.
Good sound quality for the price. However delivery took much much longer than expected. Like the design that suits the ear comfortably so you can focus on important things to do while listening music or streaming. Very interesting quality and price. great for the price, use them for jogging and they block out all the noise. Cannot comment on the lifetime of the earphones till now. earphones sound great and the earbuds are comfortable and stay in your ears. They look like wonderful heads phones unfortunately they haven't been delivered. Cheers though zavvi. Decent pair of earphones, sounds good and looks nice too! Good for the price! Veho 360 Stereo Noise Isolating Earphones have a decent sound quality and a comfortable fit. Shipping to South Africa was quick and without any hassles too! The Veho 360 Stereo Noise Isolating Earphones are very good earphones with good sound quality.